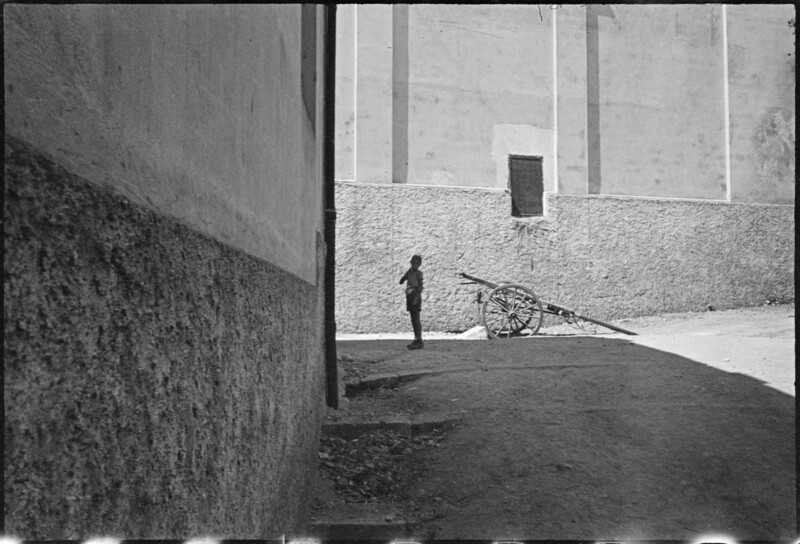 Henri Cartier-Bresson’s “The Decisive Moment” is one of the most recognised photographic books every released. 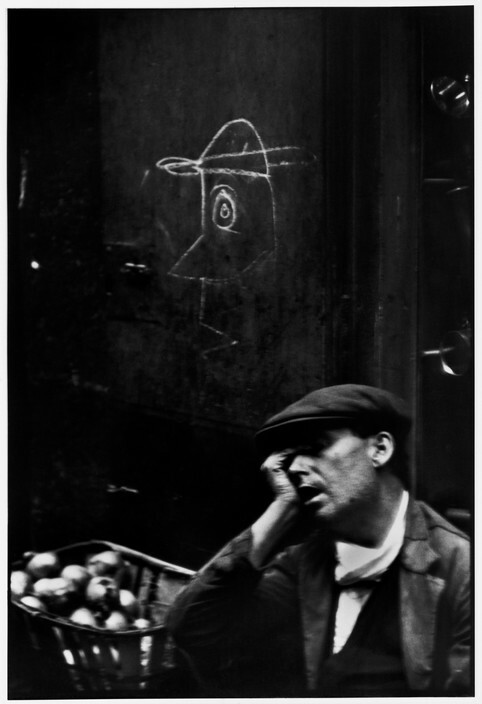 The “spiritual father” of street photography was very fond of presenting his work in books rather than prints. The Matisse cover is just the first of many joys the book will bring you. The book has been reprinted by Steidl but looks like it has already sold out? You can find it here on Amazon and here at Steidl. The book itself is beautifully presented in a slip case, dust cover and includes a book about the book… Well, it is a classic, after all. I have not seen an original print of the book, so I can’t comment about the quality of the new print vs the previous editions. The reproductions in the book are pretty basic in quality. The images almost look like scans of the original book’s pages, rather than high res scans of photos or negatives. If you are looking for studio quality prints, then this is probably not the book for you. The book is delightfully large, and the images are printed accordingly in size – nice and big! 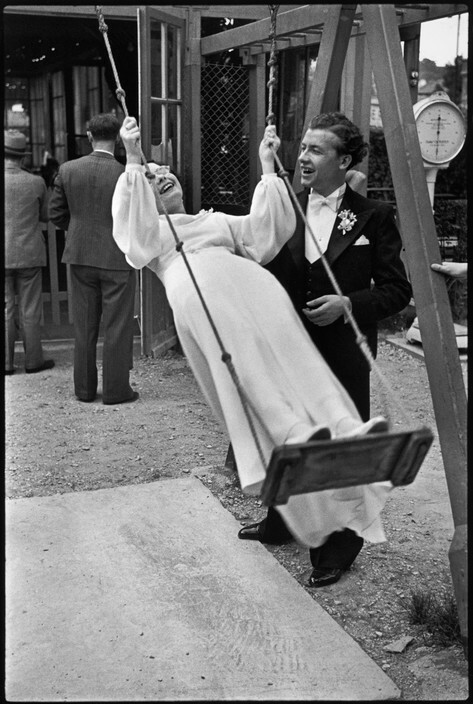 Cartier-Bresson tells two “stories” in the book – a European and Asian series of images. There are many recognisable images in the first European story. I personally find the Asian images a bit overwhelming and “busy”. They feel more like a documentary of the place rather than an exploration of the people? Amazing scene of a bride and groom – an “everyday” couple. The angle of the bride and the pavement work together to subtly provide a dynamic line. There is also something intriguing about the scales. It suggests that either the bride has been measured or perhaps the couple? 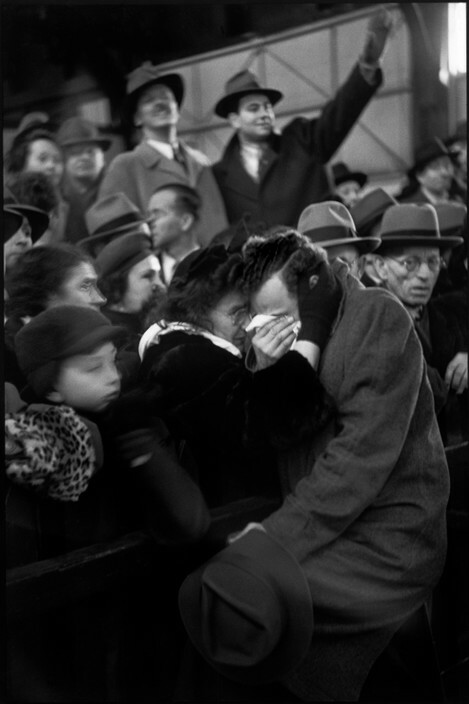 The lack of any engagement from the subjects on the background plane in the image contrasts with the excitement being displayed by the couple. FRANCE. Paris. Avenue du Maine. 1932. 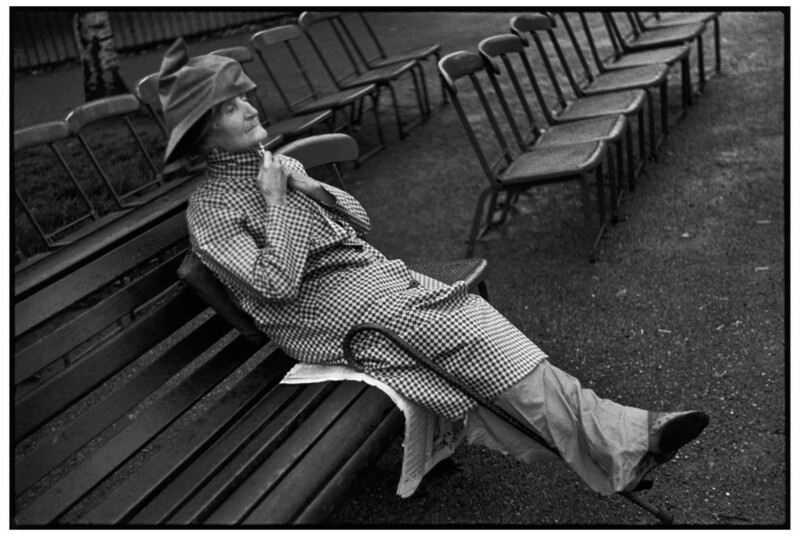 Elderly people always seem to make great subjects… Is it because they are our own future? Do we see our future selves in the aged? Wow, philosophical! My favourite element of this image is the silhouettes in the mirror on the rear plane. The parallel lines created by the table settings bring attention to the subject. The white tablecloths offer a dramatic, contrast in the image. ITALY. Basilicata. Accettura. 1951. A peasant funeral. According to custom, the priest who officiates at the entire ceremony leaves the group halfway to the burial ground. 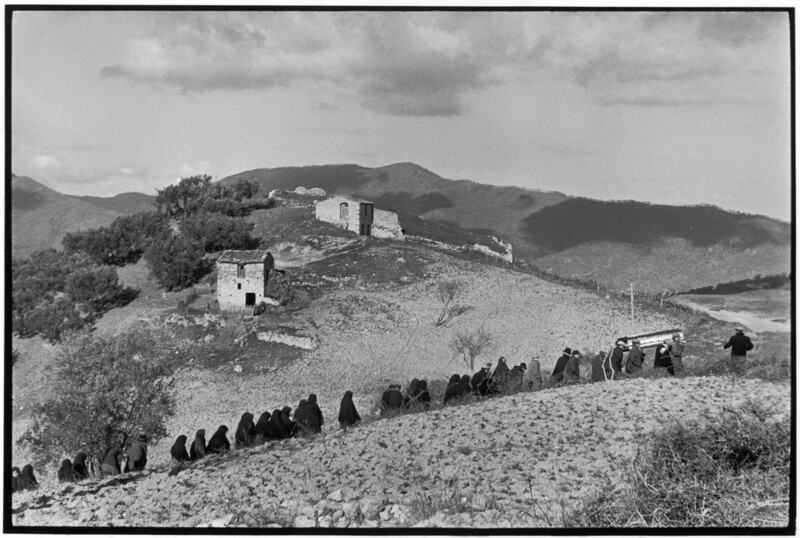 Only the bearers and mourners accompany the body up the hillside. A beautiful, dynamic diagonal line delivered by the dark subjects. The figure to ground ratio is strong and combines the balancing elements of the sky and buildings. There is an element of surprise to what is, initially, an unremarkable image. The viewer’s eye is drawn along the diagonal line and eventually lands on the coffin which complete arrests your attention. Once the coffin is recognised, the eye tends to travel back along the line of what are, now, clearly mourners. 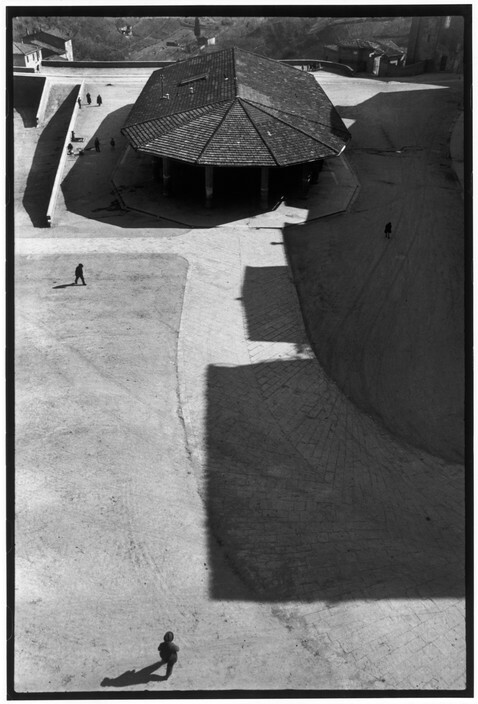 Both images remind me heavily of Fan Ho’s series of Hong Kong images. Solid blocks of clearly defined tones, contrasted with strong lines of light and shadows. Silhouettes of subjects complete the image in each case. The high perspective of the second shot gives the feeling of a broad brush stroke across the large scene. ITALY. Florence. Piazza della Signoria. 1933. 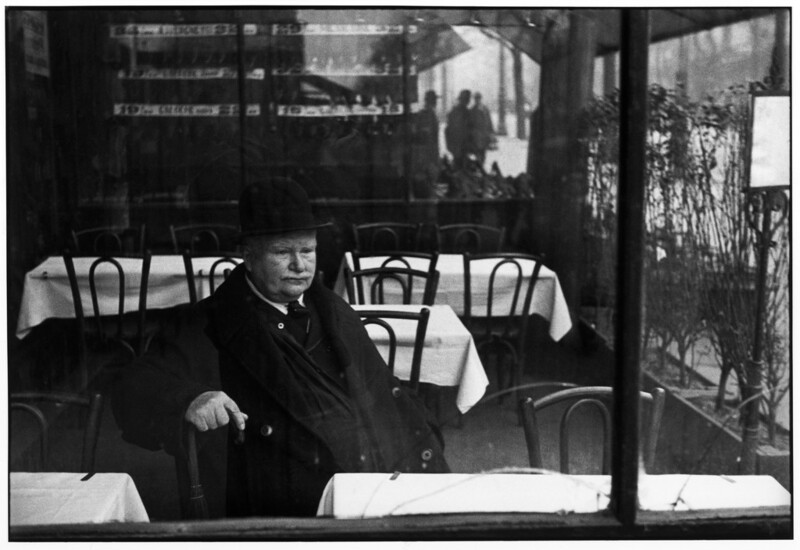 Cartier-Bresson was never afraid to crop a key element in an image, and doesn’t sweat sharpness. 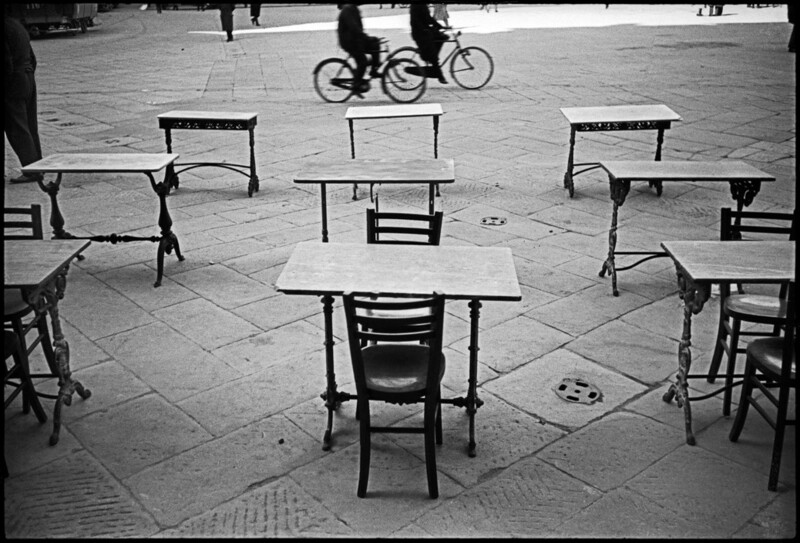 I love the repetition of the tables combined with the motion of the bicycles. Again, the image features strong blocks of tone and shadow – but with the addition of a zig zag path inviting the eye of the viewer forward, into the image. 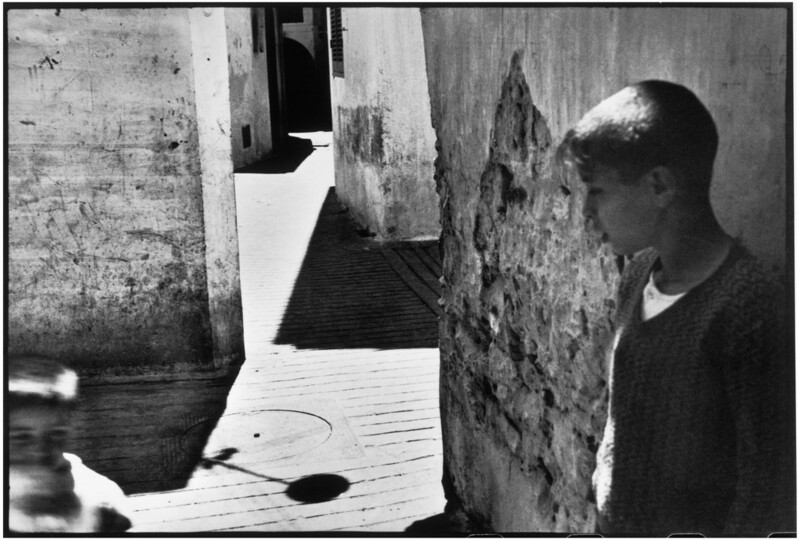 The young boy looks like he is contemplating navigating the maze ahead, bringing the viewer into the image to make the journey with him. The narrow street of Barcelona’s roughest quarter is the home of prostitutes, petty thieves and dope peddlers. But I saw a fruit vendor sleeping against a wall and was struck by the surprisingly gentle and articulate drawing scrawled there. The lack of focus or sharpness adds to the image’s sleepy feel. There is a clever juxtaposition of the subject and the image on the wall. 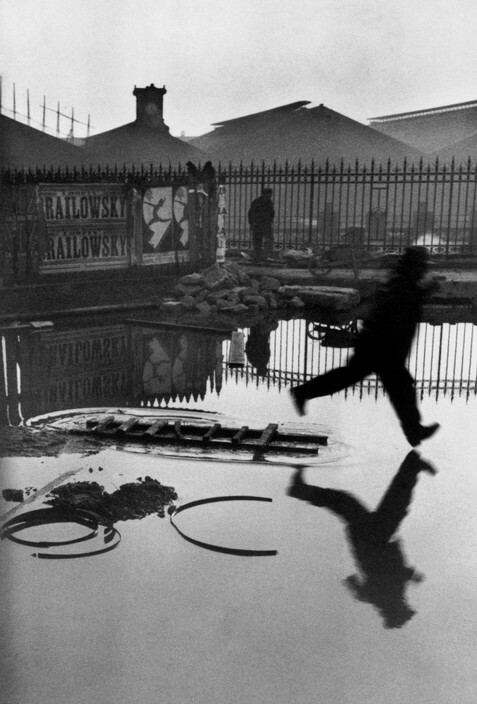 I purposefully avoided the “classics” but could not resist the image of the guy jumping puddles, as there are many simple lessons to learn from it. Tell a story – in this image, you can see where the subject has come from, why he is jumping, where he is going, and what is going to happen next. GREAT BRITAIN. England. London. Hyde Park in the grey drizzle. 1937. Clever use of parallel lines in this image. The elderly woman almost looks to be in a stiff corpse-like rictus. GREAT BRITAIN. London. Coronation of King George VI. 12 May 1937. 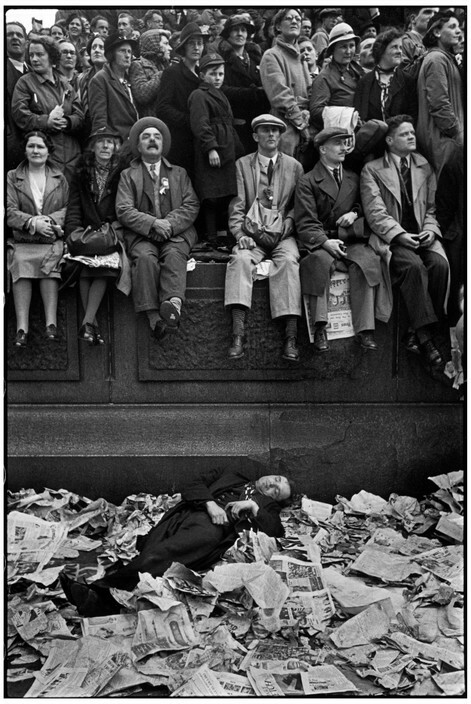 Two planes clashing again – the sleeping guy in the refuse against the rapt attention of the crowd waiting for something to happen. There is a clear space separating the two. USA. New York City. 1947. A refugees boat coming from Europe has just arrived. A mother finds her son who had been separated from her during the war. USA. New Mexico. Taos. 1947. The death of a land-owner. His body was taken out to the burial ground in a shiny black motor hearse. Members of the family rode in a stage-coach; cowhands and ranch help came on horseback. 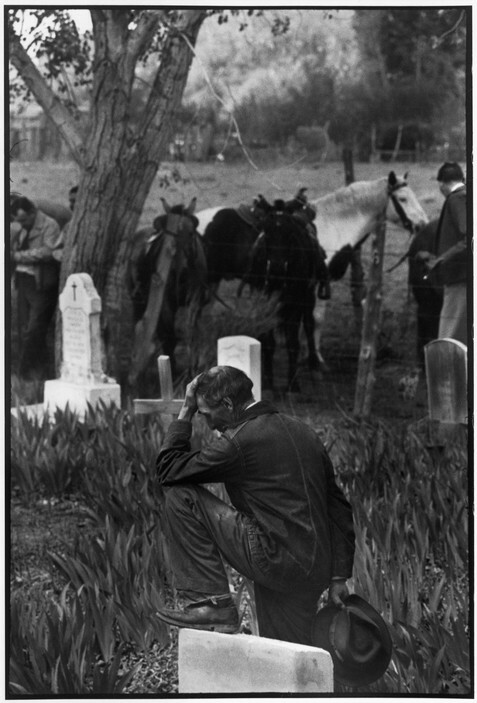 During the funeral, this old cowboy bowed his head at the graveside. Both of the above images capture a high intensity moment, isolated by a contrasting background. USA. New York City. West Point cadets and their admiring young ladies attend the Army versus Notre-Dame football game. 1947. 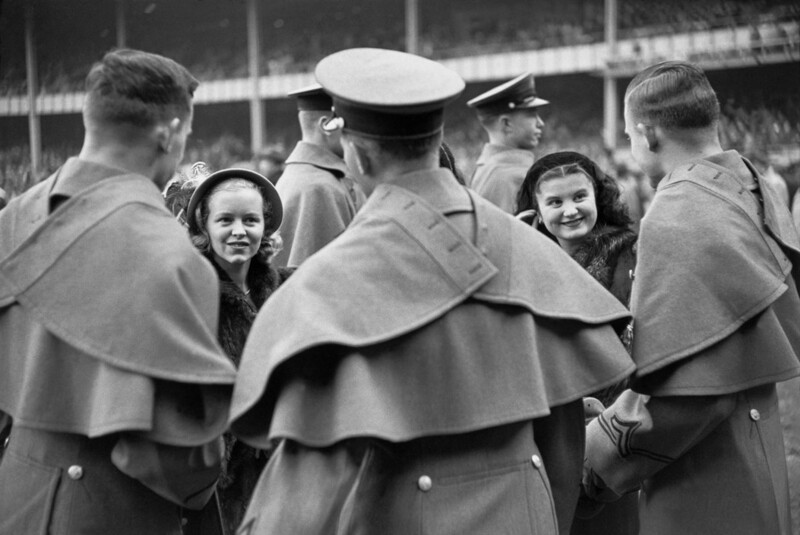 Cartier-Bresson uses the repeating triangles created by the officers’ coats to frame the female subjects. Triangles are a great shape to use in an image as either a gestalt or framing device. The “small moment” is highlighted by the enormity of the parallel lines of the walls and laneway. The man and the cat mirror each other perfectly, both looking somewhat lonely and forlorn. The parallel lines really “close in” on the subject and “zoom out” at the same time, dramatising the moment. Not sure if I have explained this very well, but it reminds me of the effect in a longer exposure where the photography zooms the lens during the exposure – but without the obvious distortion. 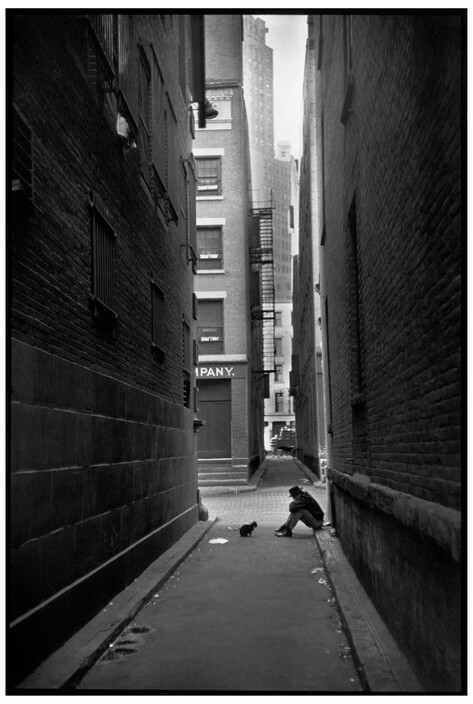 Cartier-Bresson is an inspiration and worth studying to improve your craft. The book is more of a “nice to have” volume rather than a high quality studio book. I suspect that the images are not reproduced in a high enough quality for many people. Having the book on my shelves at home is a pleasure that outweighs the quality for me. The Matisse cover was enough to win me over!